Whether this is a conversation you have in your head, or one that’s happened to you in talking to your boss, you know the hard truth: as your team grows, it becomes geometrically more complex to manage your team. 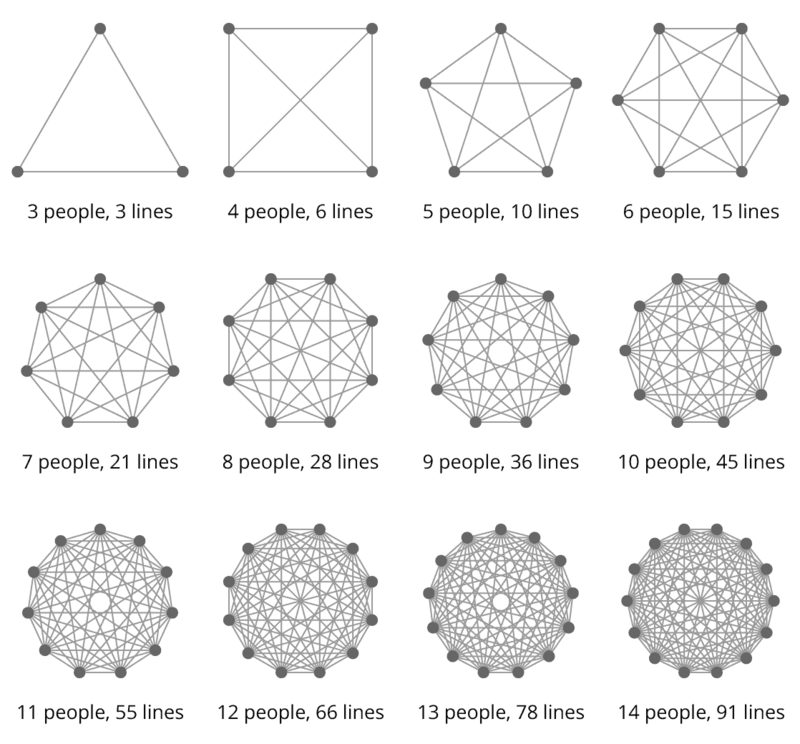 As this image from StackOverflow below shows, every person you add to a team adds many more lines of communication, making everything harder for your team. And as a manager, you’re caught in the middle of this. As your team grows, there are more tasks to delegate and outcomes to manage, more communication issues to navigate, and more interests and motivations to consider. As those issues build up, it then becomes easy to have soft skills slip. Unfortunately, it’s exactly then, when you don’t give everyone the attention, feedback, and coaching they need, you all lose. Your team can easily slip into disorder or simply resentment for you as you break promises, forget what matters to them, and struggle under the growing stress. Tomas Tunguz, VC at RedPoint Ventures deep dives into the concept from many sources to conclude “roughly 7” and explores how “Span of Control” and “Span of Responsibility” impact it. 1) Let go of your fears and desire for direct control. One of the first things you have to do is accept you can’t have first level contact with everyone on your team anymore. This can be scary if you’re used to setting the standard and pace on your team, and worry that without direct influence that will change. It shouldn’t. If you’re going to grow as a leader and do the best you can for each person on your team you have to be willing to give up that control. When your team grows too big you can’t serve your team the way you were before. The only way to give your team the kind of leadership you aspire to is by developing leaders under you to lead as you do; they’ll take responsibility for day to day management of some members of your team, while you develop them as managers. Everyone wins when no one’s plate is overflowing and dropping things that shouldn’t be dropped or missed. 2) Look for the leaders already on your team. When your team is that big you need help, fast. The situation is only going to get worse as time goes by and things build up, even if the team doesn’t grow further. The easiest solution is to identify and promote from within your team: they already know your culture, how the team operates, and your expectations. Promoting from your team can also be powerful, positive signaling. Whomever you promote is a signal to your team what you reward; they’re getting a new title, new power, and new responsibilities. Of course, this choice is a double-edge sword. Make sure they’re deserving of that reward and that the behavior they display are things you want to see more of as you just showed that’s what gets promoted. Living the values is a good reason. Sucking up to you and playing politics is not. Reasonable Workload: Both managers can have smaller teams as they become acclimated to management, while still having a major impact on your workload (4 people for each of them leaves you with only 4 directs, including them). Better Focus: With 2 new managers, all of your efforts to coach and develop them is multiplied. Every book you buy and lesson you teach goes to 2 people, magnifying your efforts often with as little effort as adding a second email in the To: field in an email or a 2nd quantity on a purchase. Peer Support: Being a manager can be lonely and scary. By promoting 2 people at once, they can support each other as they have questions, learn new things, and look for someone facing the same challenges as them. Backup Plan: If one of them doesn’t work out and wants to return to being an individual contributor, you aren’t stuck starting from scratch and can return their team to you and the other manager. 3) Sell them on the opportunity and set them up for success. Some people may be excited by the prospect of managing, while others may need to be convinced. Depending on their past experiences and biases, they may have different perceptions of such a role, so take the time to sell them on the virtues and benefits of the job. Just be mindful of people becoming managers for the wrong reasons, and choose who you promote wisely. Empathy: Do they consider other people’s opinions and viewpoints? Managers must understand the views of others and avoid a one-size-fits-all management approach. Attention to detail: Do they produce quality work on their own or do you have to push them to maintain your desired standard? Managers set the bar, so be sure it’s a bar you’ll accept. Organized: Do they stay on top of their own work well enough you think they can do it for others? A disorganized manager will have a disorganized team. Leading: Have you seen them successfully take charge in a group before to tackle a problem? This shows they may have an interest in managing and the team is more likely to accept them as a leader. Hungry to learn: Do they demonstrate an interest in growth and learning? Management has a long and steep learning curve. You can read additional good qualities to look for in developing leaders in this Inc article here. 4) Coach and develop them. Only 40% feel they have the chance to learn and grow at work. 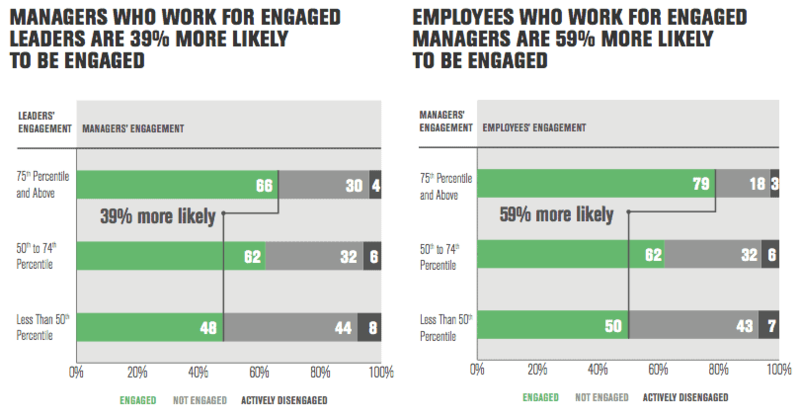 Only 33% feel someone at work encourages their development. Don’t be on the negative end of those statistics. 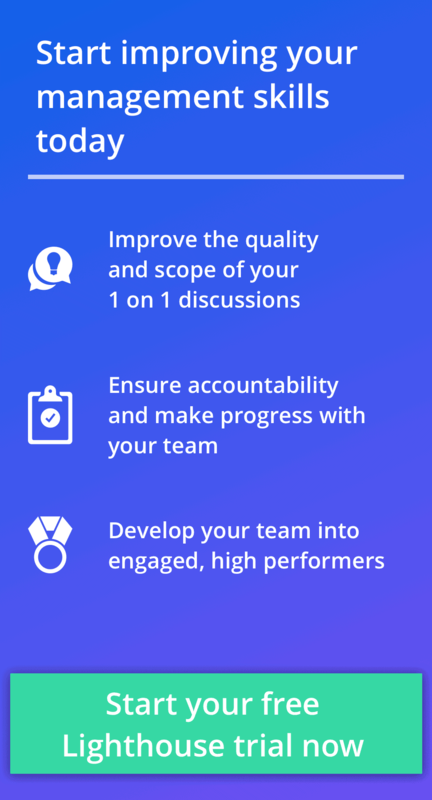 The tradeoff of reducing your team size should be that you spend some of your time saved investing heavily in developing them to be successful. Share the tricks, tips, and tactics you’ve learned along the way. Ask yourself: If you could talk to yourself on the first day you became a manager, what would you tell yourself? Teach them those things. 5) Keep your one on ones with them! When you become a manager, you don’t stop having questions and problems you need help with. In fact, now you have more! You’re in a new role where you have other people’s problems to solve, too. Not having an outlet to get advice and understanding from your manager can be devastating to you and your team. In other words, spend more time with people when they are new to a role or in one that changes more rapidly. Even if they didn’t need one on ones very often in their past role, they’ll likely need them more as they get comfortable in their new role. Remember: If your managers aren’t happy, it’s unlikely their team will be happy and the one on one is the best tool to ensure your team is happy. But wait! 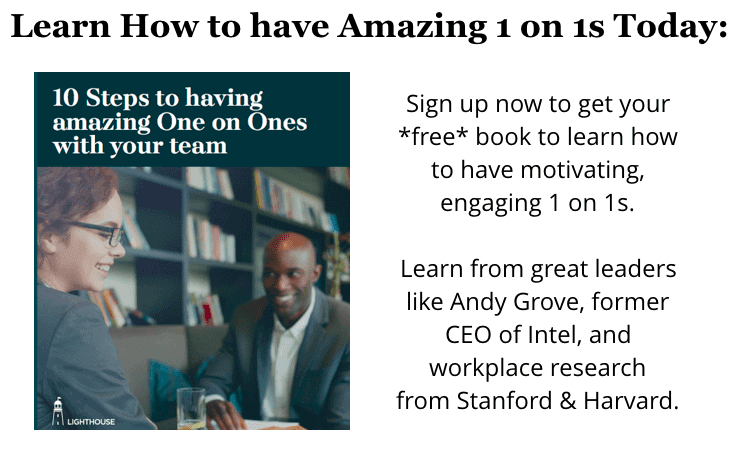 …What if no one on your team wants to lead? If you really see no one with the potential or interest, take a second look. Ask your team who they think would make a good leader. If everyone still just wants to do their individual contributor jobs then you may want to look outside your team for help rather than forcing someone to do a job they don’t want. However, before looking outside the company, ask if another manager in your department has excess leaders looking for such a role. It’s better to have a new manager that already is part of your company’s culture take the lead than have to look outside the company. If all else fails, hiring outside can work. Just be mindful of what they may not know by not having risen in the ranks at your company and look for any potential culture biases they bring with them. If it does come to this, consider how you can start growing your own talent; it’s a better reward to show people they can advance in management and likely much cheaper than having to hire in all of your senior talent. Want to bring consistently, good management practices to you and your team’s leaders? Want help having a happy, motivated team? 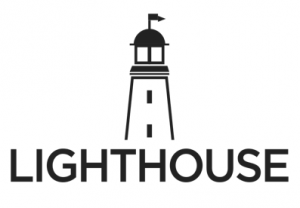 Then sign up for Lighthouse. Backed by research and experience, it helps managers focus on what matters most.